I just came across this little promotion on the Meet the Mormons Facebook page. Great marketing pitch. Who doesn’t like David Archuleta? And what better way to spread the word than to take the message viral using all the social media tools of the day? 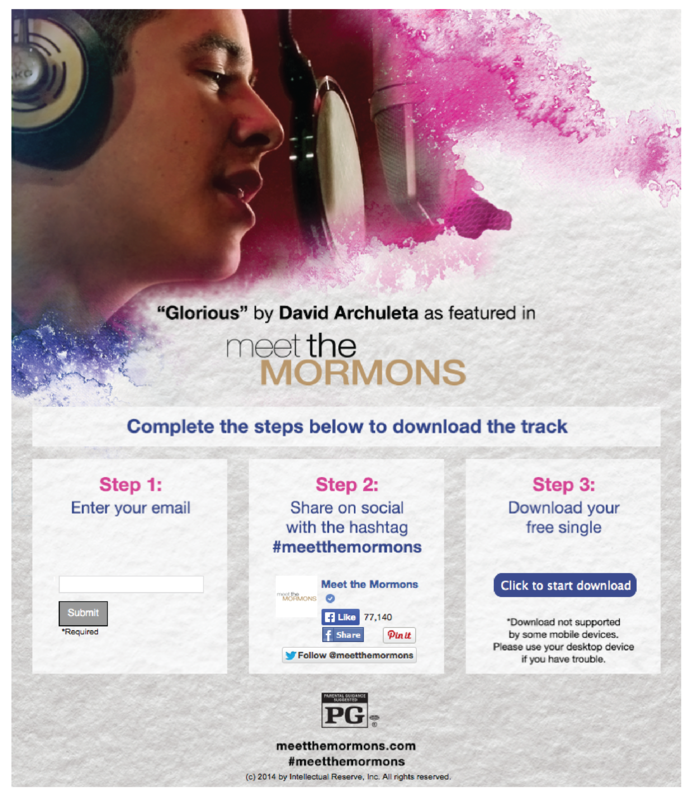 I don’t love the idea that the church wants my email, wants me to tweet, pinterest, facebook, follow and/or hashtag, all so I can get a “free” single of David’s song. 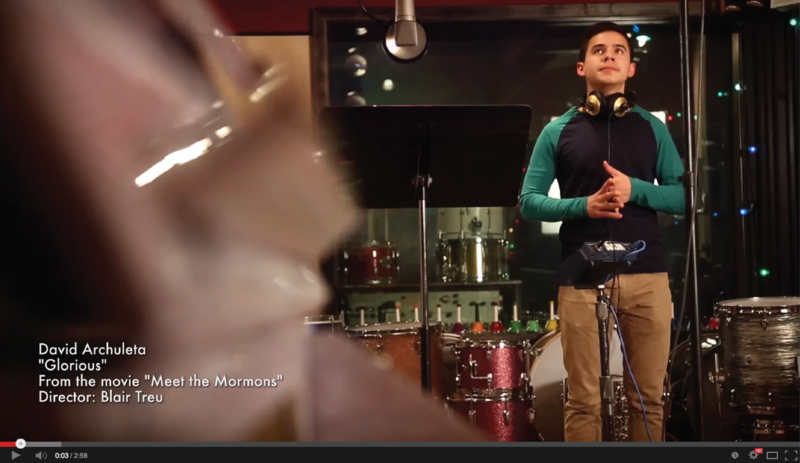 Obviously a joint marketing venture between him and the church, promoting Archuleta as well as the new movie. There are times when you might feel aimless and can’t see the places where you belong. But you will find that there is a purpose, it’s been there within you all along. And when you’re near it…you can almost hear it. It’s like a symphony…just keep listening, and pretty soon you’ll start to figure out your part. Everyone plays a piece in their own melodies… in each one of us… It’s glorious. And you will know how to let it ring out as you discover who you are. And those around you will start to wake up to the sounds that are in their hearts. It’s all amazing what we’re all creating. It’s like a symphony…just keep listening and pretty soon you’ll start to figure out your part. Everyone plays a piece in their own melodies… in each one of us…ohhh… is glorious. As you feel the notes build… you will see. Everyone plays a piece in their own melodies… and each one of us…ohhh… is glorious. It all kind of reminds me of the feel good movie “August Rush.” A movie about finding your purpose in life, where you belong. Interesting that the lyrics don’t mention God or even allude to a Creator. It mentions “we’re all creating” and speaks of symphonies, but feels very self-focused rather than God-focused. (Maybe this really isn’t a proselytizing effort!). I am very curious if and how much speakers in General Conference will plug the movie. I say they plug it hard. I don’t think the timing of the release, the weekend after Conference (and the BYU-USU football game) is a coincidence. If nothing else, I predict endless ads between sessions. I hope I’m wrong. But then, why wouldn’t they? It’s a very important church business investment. I’ve never liked that Facebook and other social identities encourage such illusionary self-promotions. We all know people who sit at home all day, interacting in this fake world, taking endless selfies, always trying to portray how “blissful” their life is. I fear this movie will be nothing more than a really expensive, glorified Facebook promotion of 6 otherwise very nice people. Will this movie promote and encourage more Facebook idolatry? Will it make me jealous that I’m not the Candy Bomber or not as successful and exciting as other “Great” Mormons? Will I feel as “glorious” as these 6 (7 if you include David Archuleta) individuals? Isn’t this part of our problem in the world / church? We feel we can’t keep up with the Joneses, and the Joneses now tweet from Hawaii, where brother and sister Jones and their 4 perfect kids just posed for a selfie all at the Iron Man finish line. Crap! Now how do we keep up? 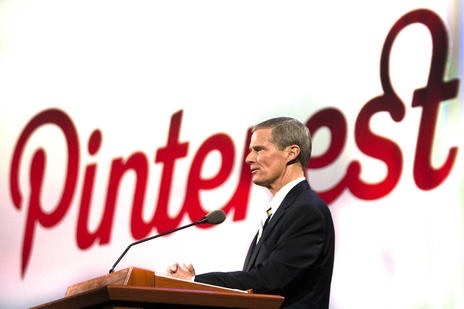 Well, it’s easy, lots of makeup, a tanning bed, teeth whitener, a little Photoshop, an expensive camera helps, and your own “glorious” post from… how about Temple Square. That will make those worldly Joneses feel dumb. You get the idea. Are we really supposed to portray and see ourselves as glorious anyway? If you do a search of the term glorious in the scriptures you will not see any mortal referred to by God as glorious. Not that I could find. You may become “glorious in the resurrection” if true and faithful in this life. But, Glory is for God! Not men. King Benjamin reminds us we are less than the dust of the earth, far from glorious, no matter if we have “figured out our part” or not. Even those like this righteous King who do figure it out, i.e. are redeemed, still consider themselves less than dust and preach repentance not self-promotion. 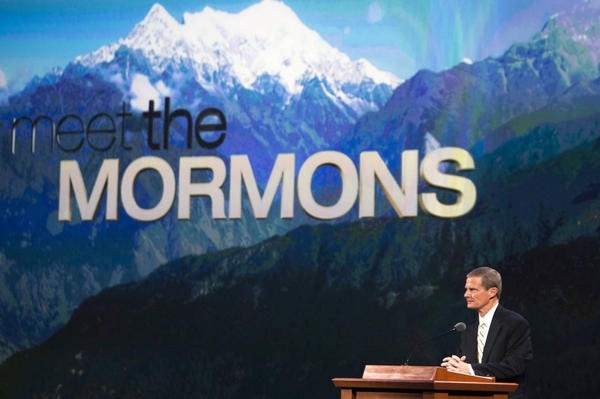 This entry was posted in Main and tagged Glorious, Less than Dust, Meet the Mormons, self-promotion, vanity on October 3, 2014 by Bishop Anon.